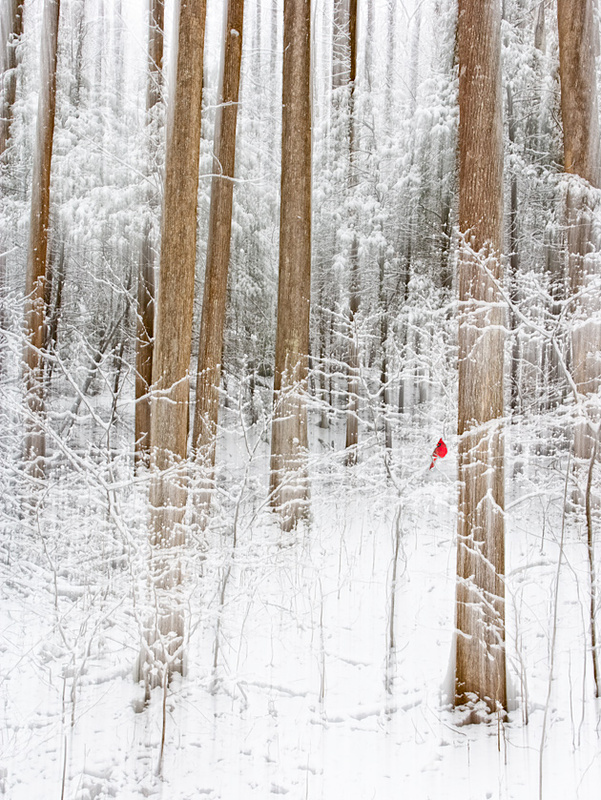 Winter Silence is my best-selling winter Smoky Mountains photos. It’s a dreamy, ethereal snow scene that was taken out in the Greenbrier area of the Smokies during a late winter storm. The technique used to capture the image is unusual. The camera was on a tripod, set to a long exposure time of about two seconds. For the first second or so I kept the camera still to lock in the image, but then for the last half second I moved the camera upwards. This created a blur effect that adds to the mood of quiet, ethereal silence in the snow. This photo was first offered without the red cardinal, and was a modest seller. After I decided that the nearly monochrome winter snow scene would benefit from a dash of color, the cardinal was blended in from a different photograph. As soon as the red bird was added, sales took off! You can order Winter Silence with or without the red cardinal, but most people prefer the splash of red that the cardinal gives the scene. And if you’re visiting the Smokies or Gatlinburg, please stop in to see my complete display of Smoky Mountains photos at the William Britten Gallery along the historic Arts and Crafts Trail on Glades Rd in Gatlinburg. I bought a small copy of this print and put it in a 8×10 frame with a black matt. It is absolutely beautiful beside my larger Smoky Mountain Moonrise in my den. My little piece of Heaven from my trip to the Great Smoky Mountains. Thanks Myra! I like to hear that my photos found a good home.